The World Economic Forum recognizes the importance of integrating religious perspectives into efforts for shaping global, regional and industry agendas. Since 2001, the World Economic Forum has been engaging various faith communities in inter-faith dialogue, most notably through our Community for West-Islam dialogue, a dynamic community of business, political, religious, media and opinion leaders engaged in dialogue to promote understanding across different segments of society in the West and Muslim world. During this period, we have made significant achievements through constructive dialogue, support for action-oriented projects, awards to recognize significant contributions in this domain and, most recently, an Annual Report on the State of Dialogue. This influential global community engages leaders from the world’s major religions in dialogue with each other and other stakeholders shaping the global agenda, such as political leaders, business leaders, Young Global Leaders and NGO leaders. The Global Agenda Council on Faith is a community of thought leaders and experts exploring the challenges that lie in the interactions between religion and society, religion and peace building, and religion and business, and works on identifying the most efficient and actionable solutions to these challenges. In 2008, the first in a series of annual publications focused on the state of dialogue between the Islamic and Western worlds. 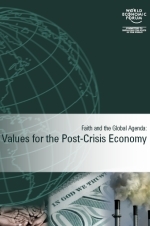 The 2009 report compiles editorials on the topic of “Values in the Post-Crisis Economy” from over 15 global Religious Leaders and faith organizations, and contains a unique public opinion poll on values which points to a trust deficit regarding values in the business world. In 2010, the report will continue to explore public opinion on the role of faith in global affairs.